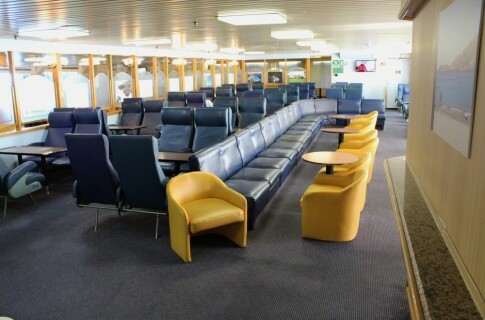 May 2016 will mark 40 years since Townsend Thoresen took delivery of the Viking Viscount, the last of their ‘Super Viking’ quartet for Southampton and Felixstowe service. We have looked in the past at two of her sisters, the Viking Venturer and Viking Voyager but today the ‘Viscount’ is the last survivor. 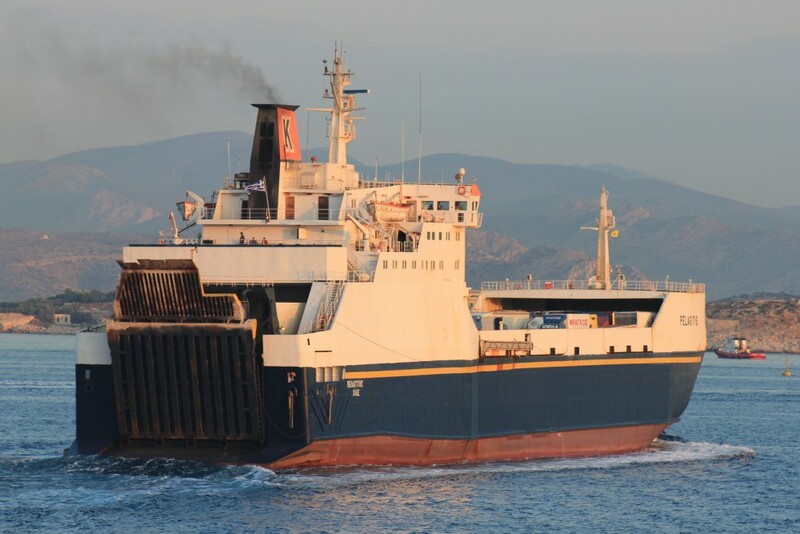 After passing to TT’s successor P&O European Ferries in 1987 she ended her English Channel days more than two decades ago but continues operating in Greece as the Vitsentzos Kornaros for her only subsequent operator, Lane Lines. 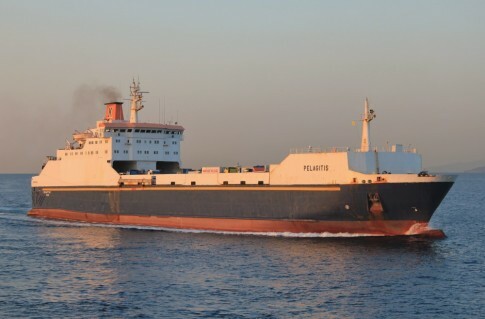 Early days at Felixstowe where the operating company was technically still the Atlantic Steam Navigation Co with their Transport Ferry Service name still in use. 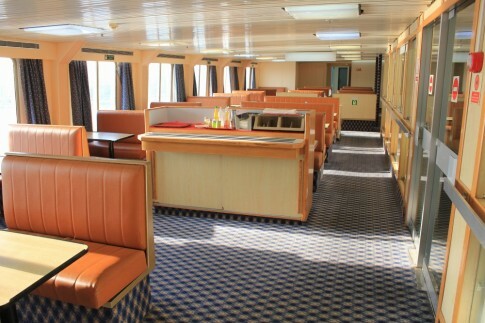 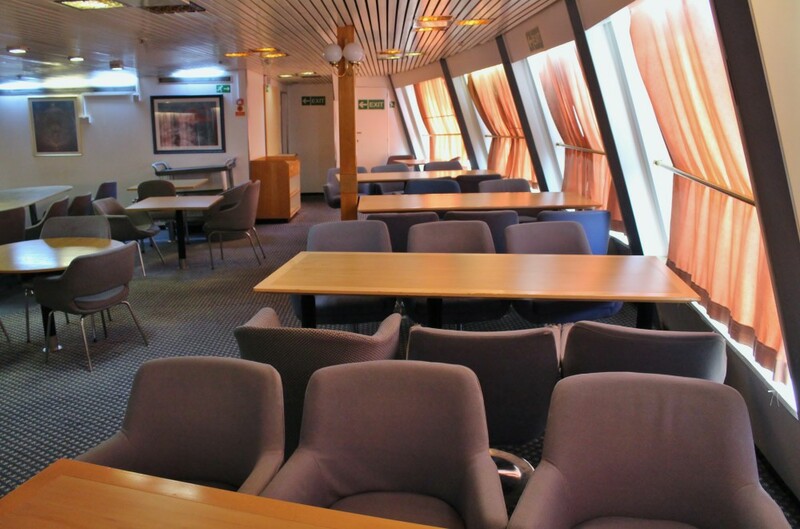 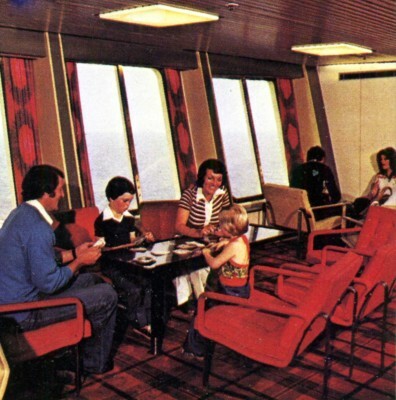 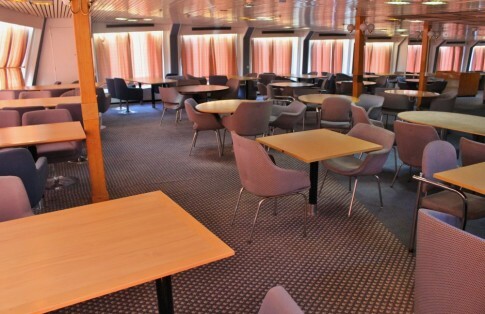 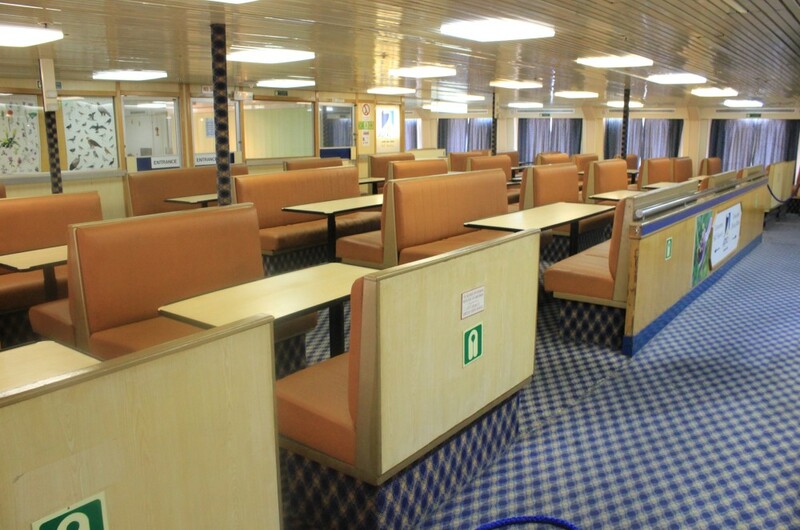 The bar areas, forward and to port, on the Super Vikings were certainly the funkiest spots on any Townsend Thoresen ferry – if not quite the equal of contemporary ships like the St Edmund or Tor Britannia. 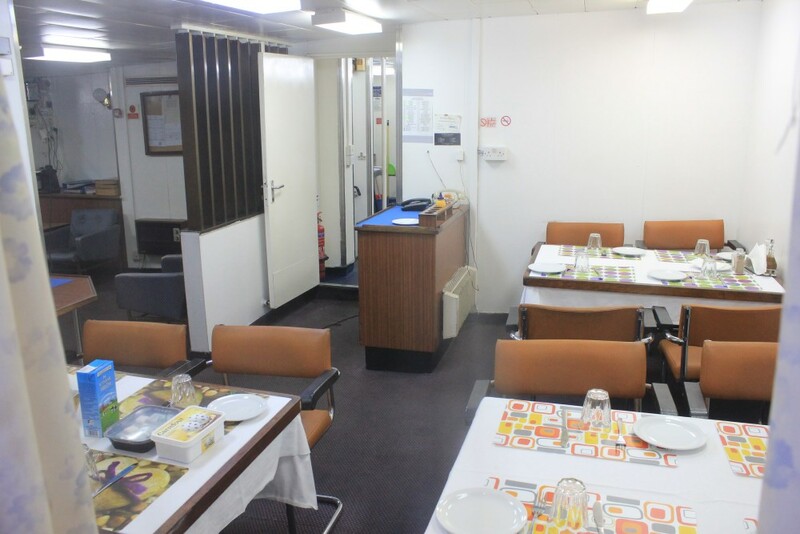 The aft restaurant was also pleasant but the rest of the ships’ accommodation including the Food Fayre self-service cafeteria was largely unremarkable. 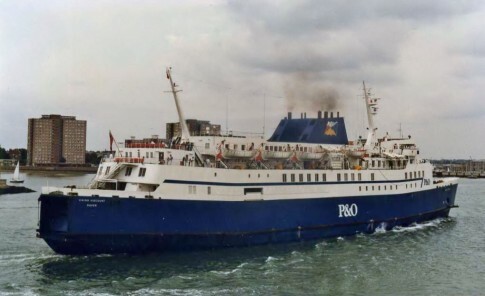 The Viking Viscount and Viking Voyager transferred to the Western Channel in 1986 and the 'Viscount' is seen here arriving at Portsmouth in P&O blue in July 1988. She is still showing her original port of Registry, Dover; this would change to Portsmouth when the ship was renamed Pride of Winchester in 1989. 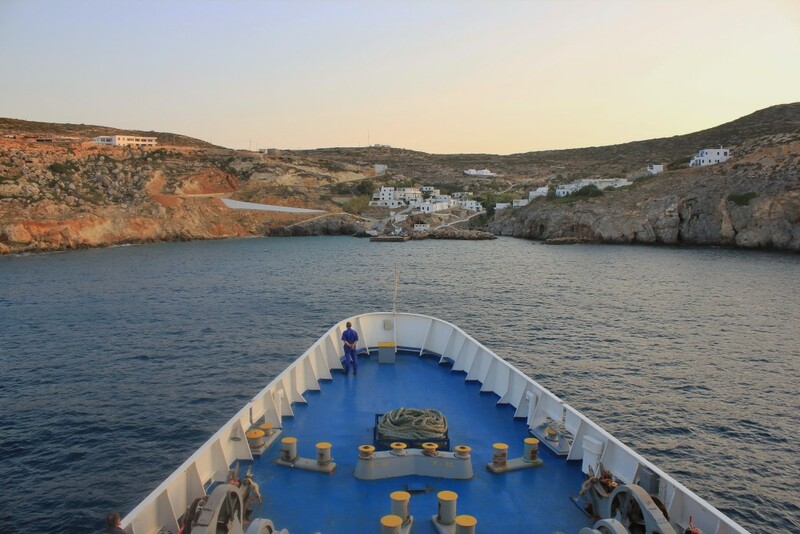 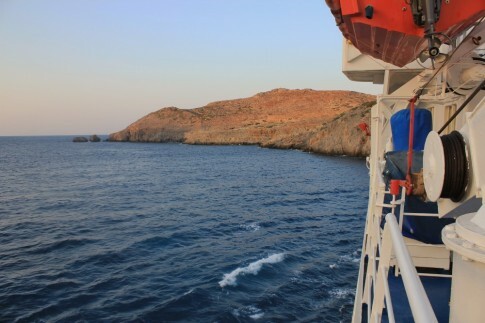 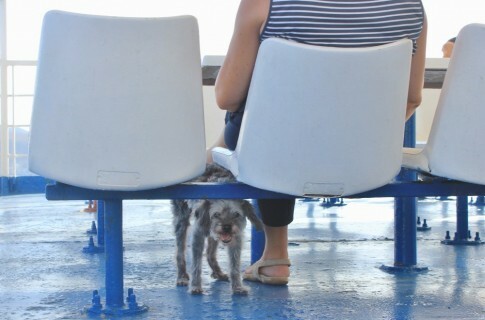 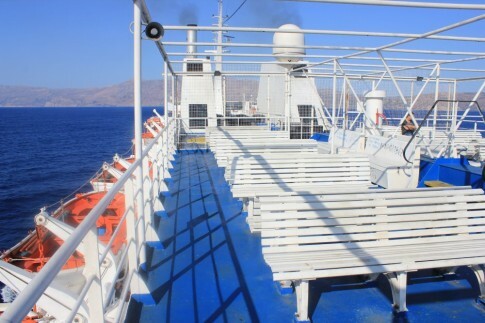 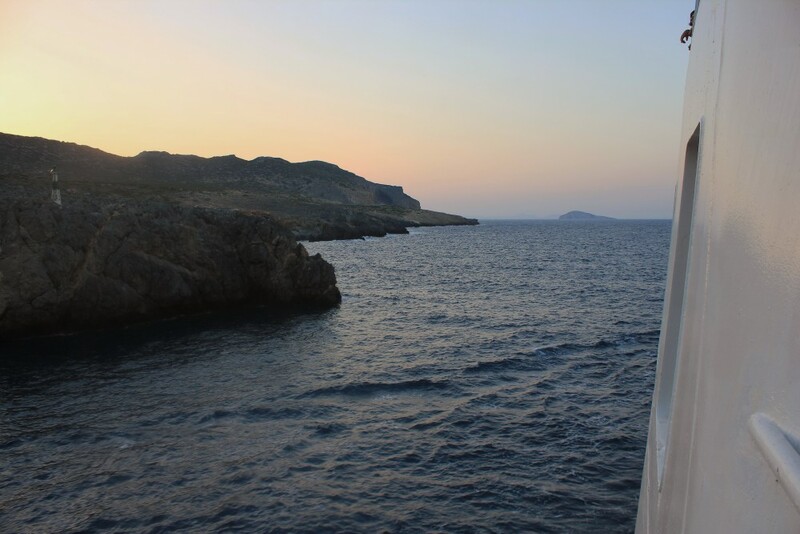 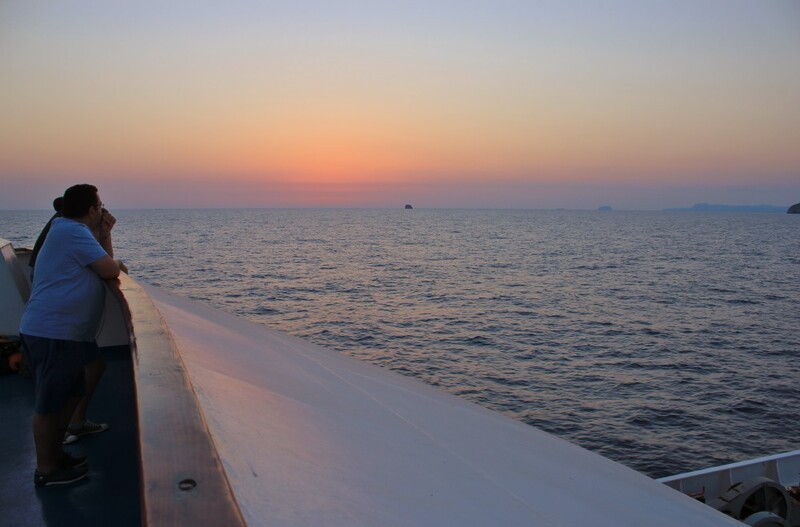 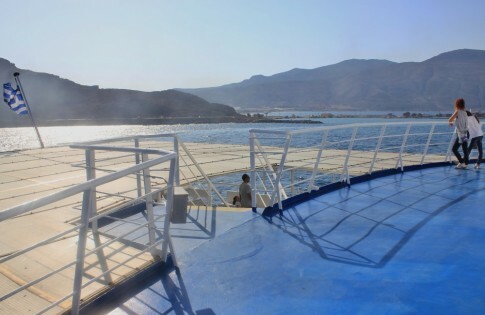 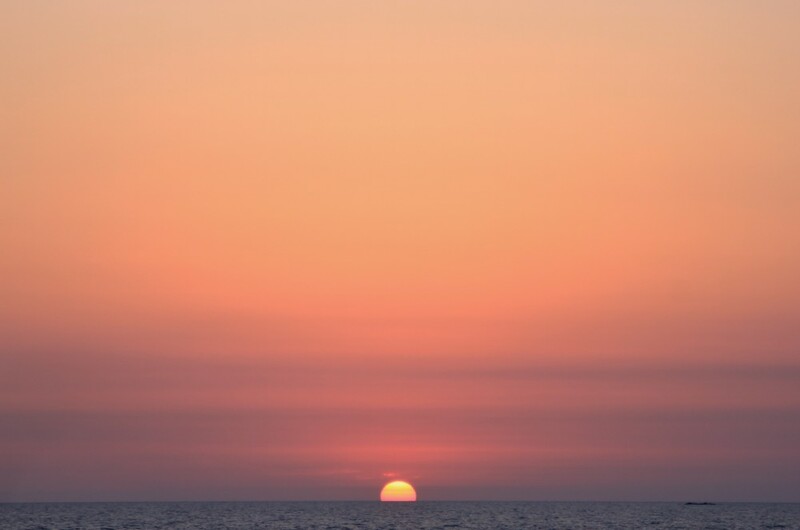 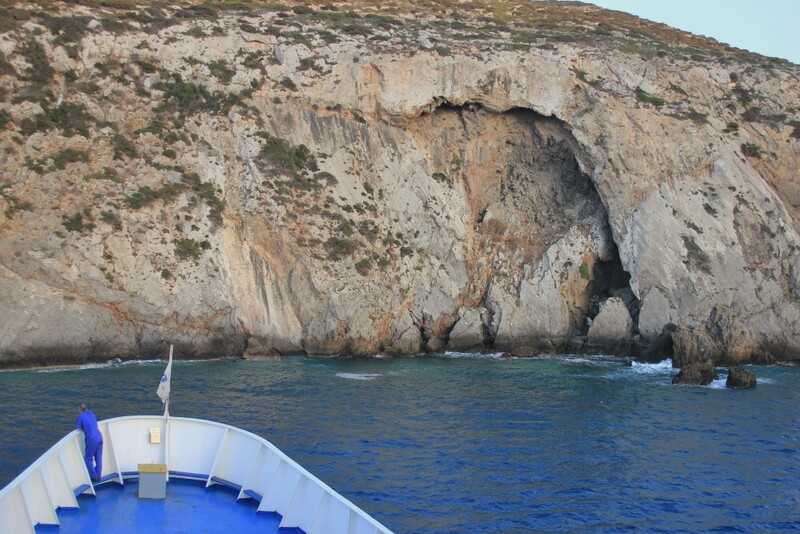 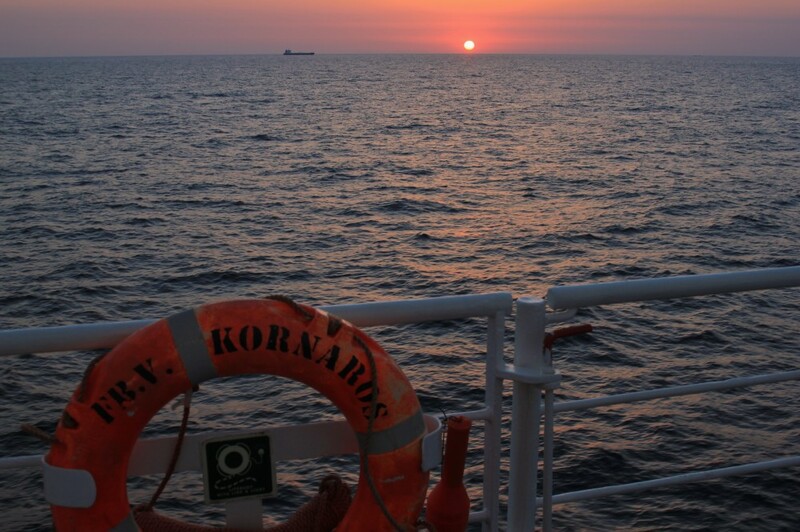 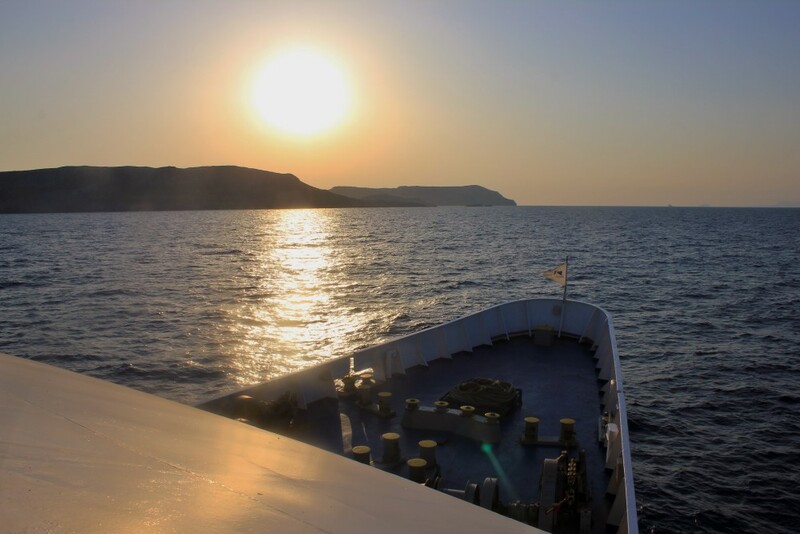 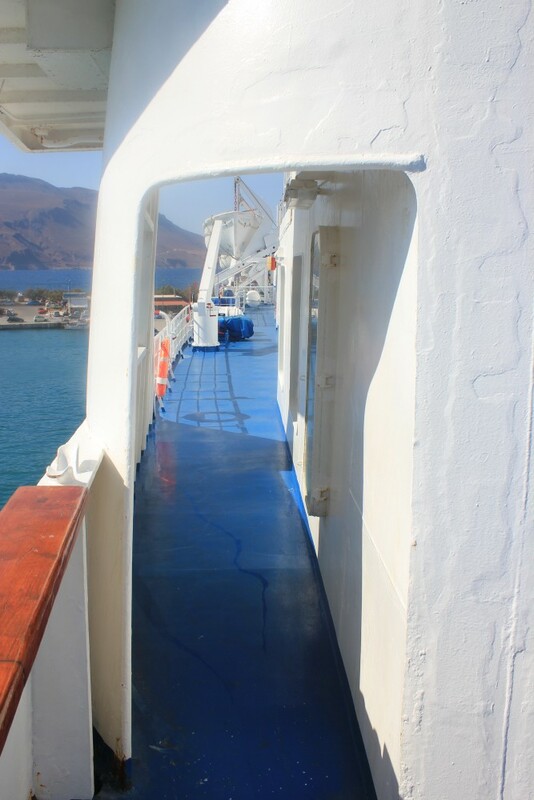 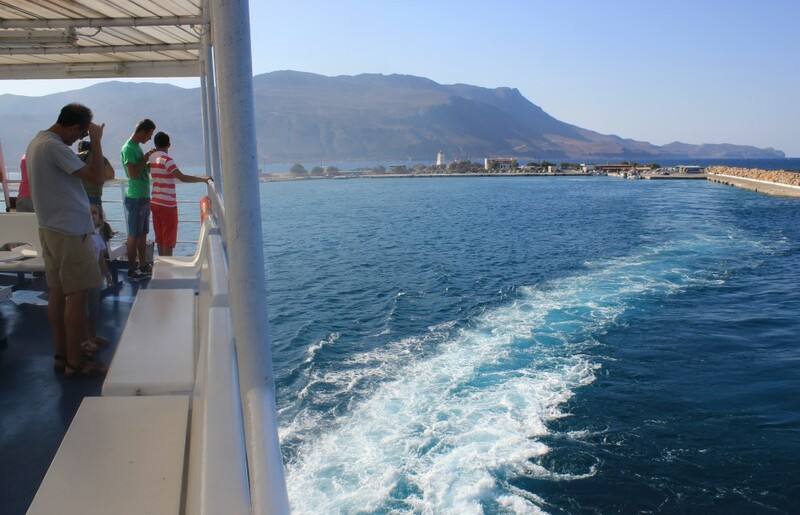 The images below are from a voyage in September 2013 on the ship’s regular operation between Kissamos on Crete to Piraeus via the islands of Kythira and its tiny neighbour Antikythera. 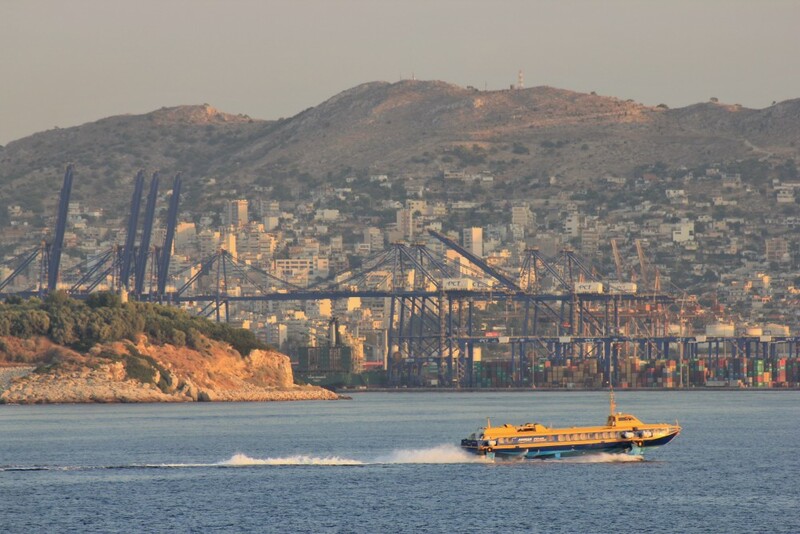 The ship provides a direct link to the port of Athens for these half-forgotten corners of the Aegean, but it is a somewhat controversial one. 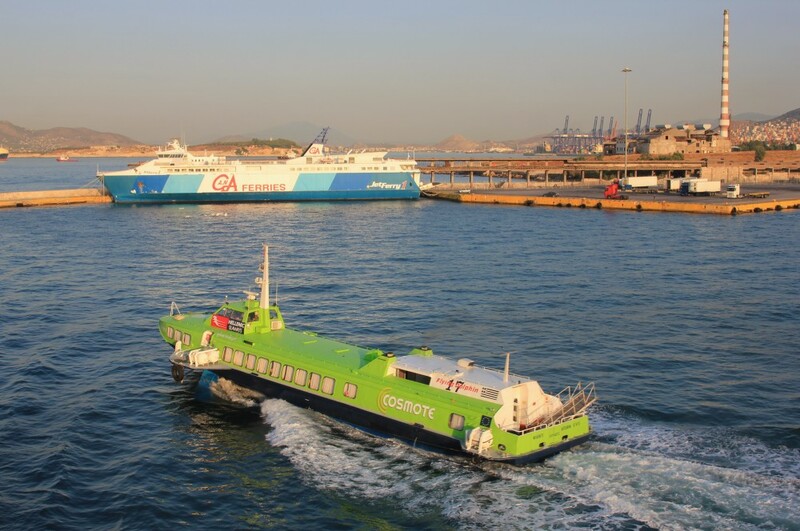 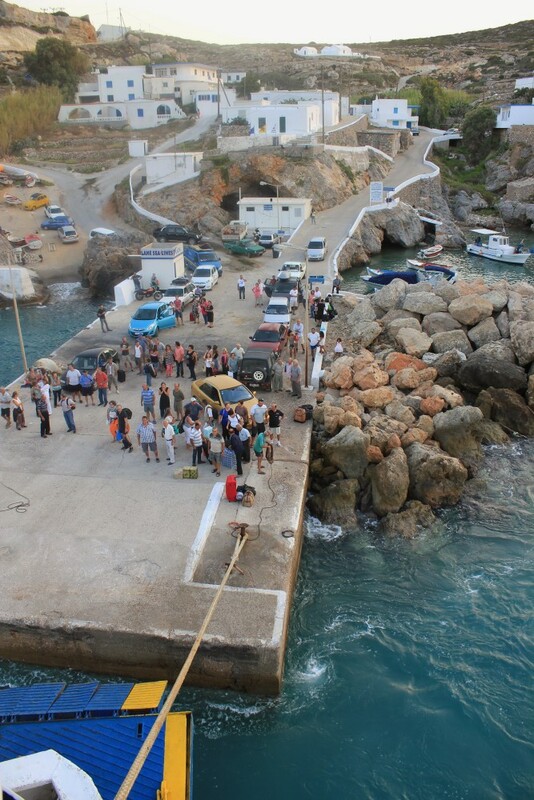 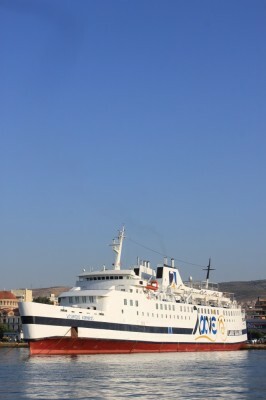 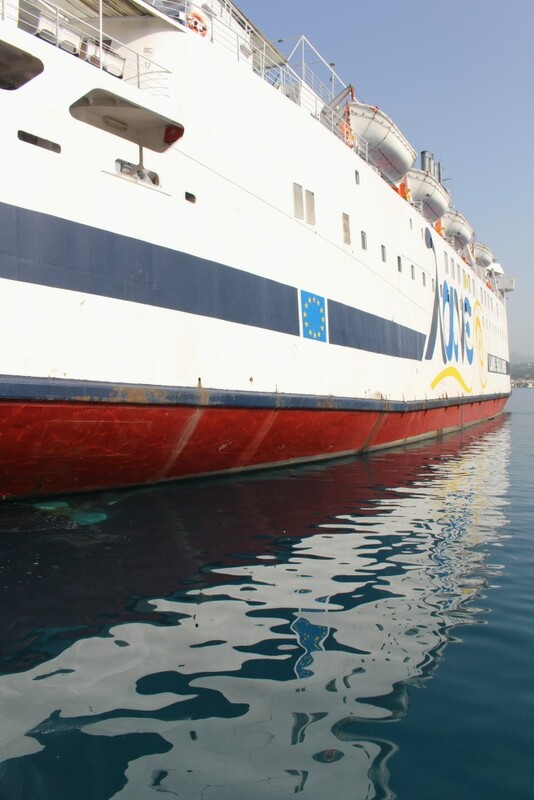 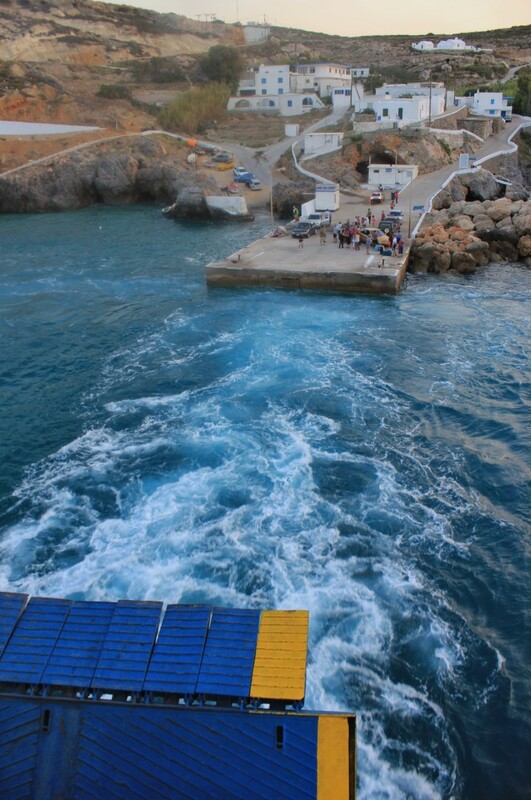 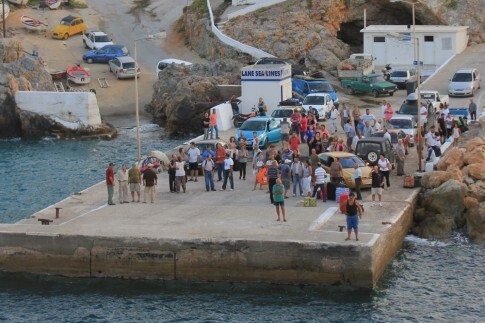 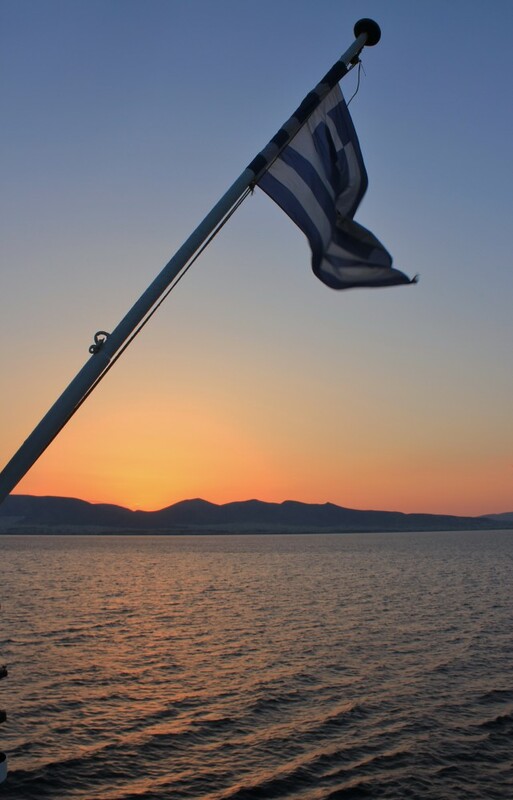 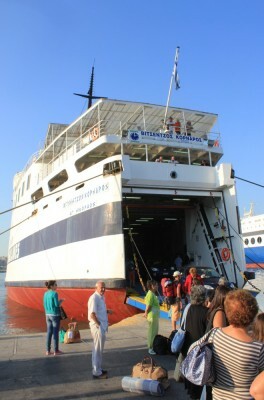 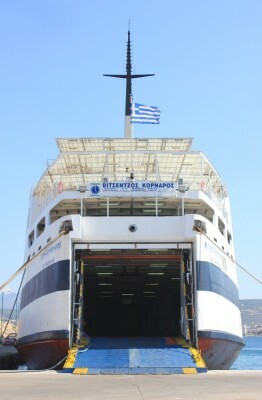 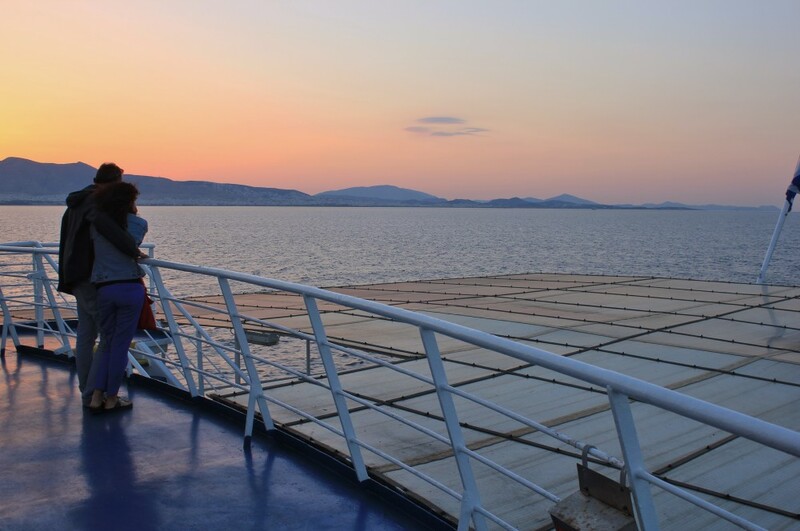 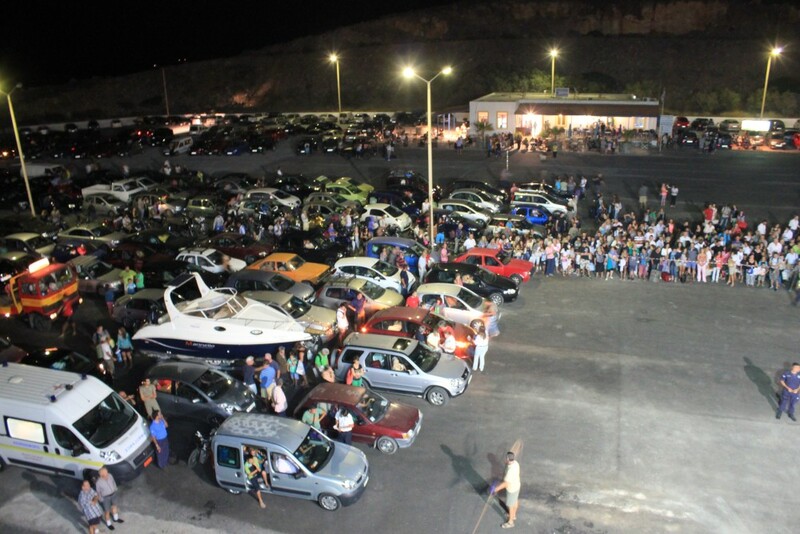 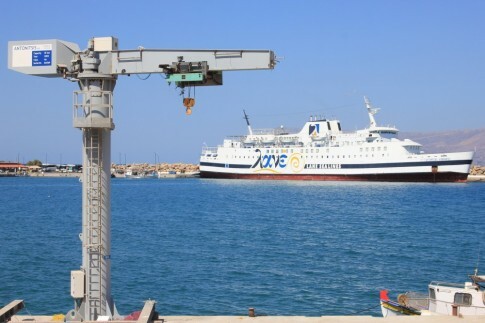 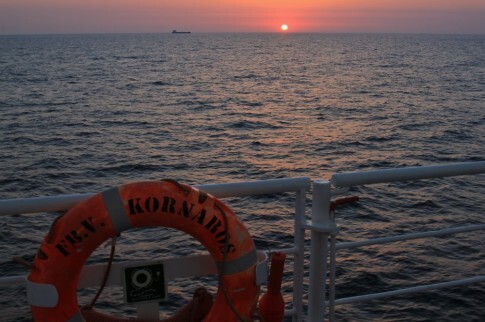 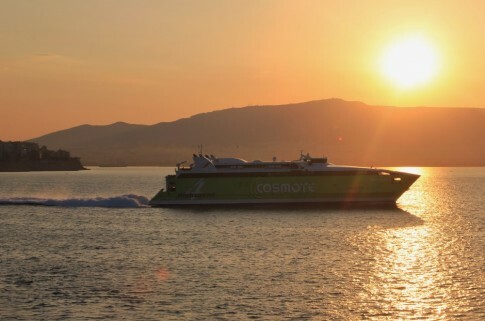 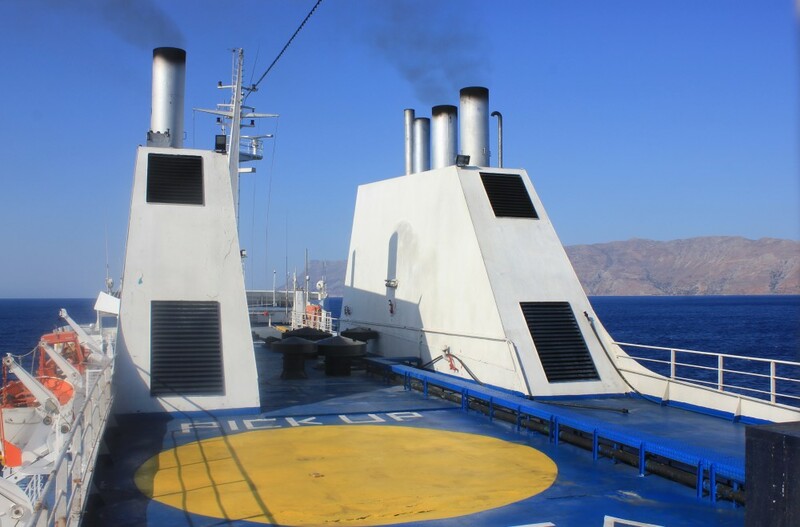 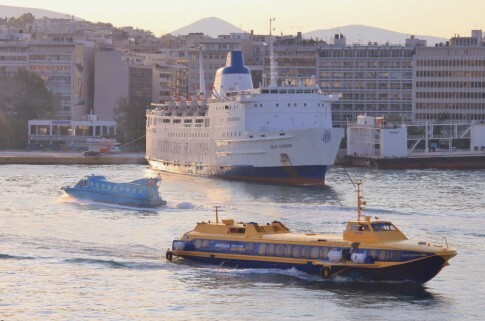 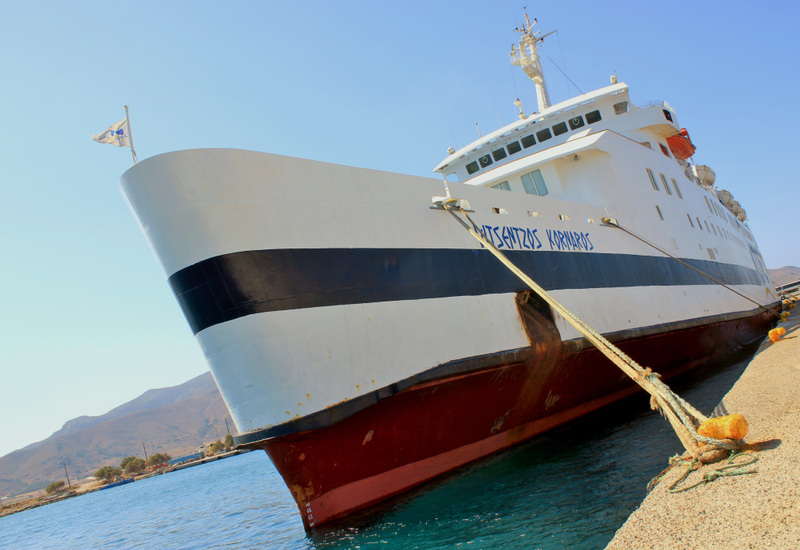 The Vitsentzos Kornaros is heavily subsidised – in 2013 at a cost of almost Euro200 per passenger carried making this the most expensive ferry operation that the Greek government supports. 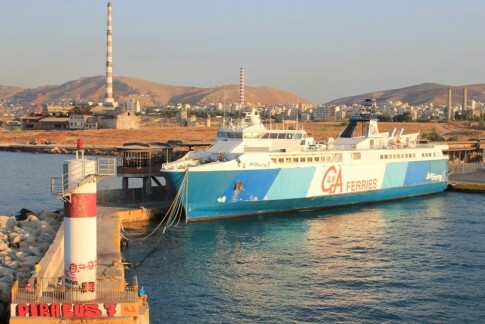 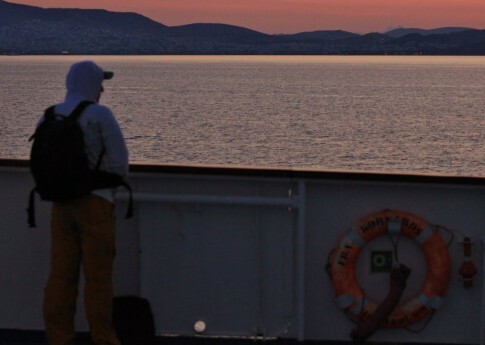 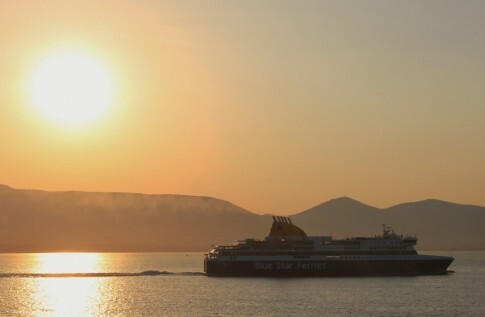 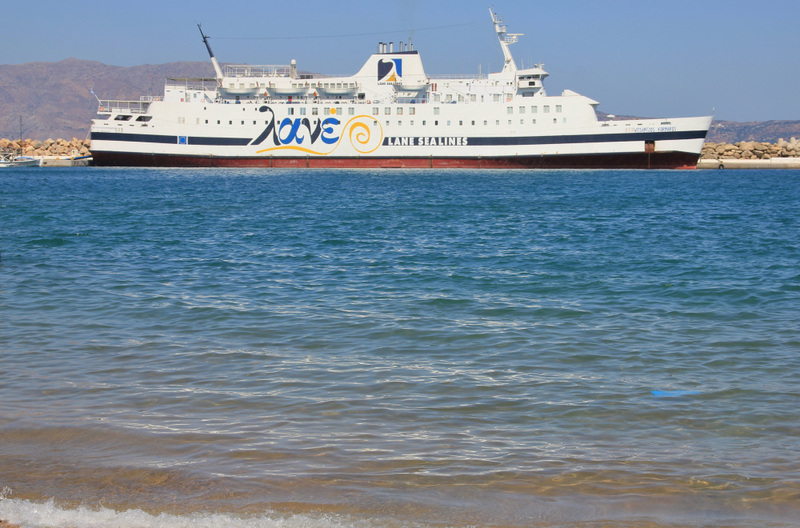 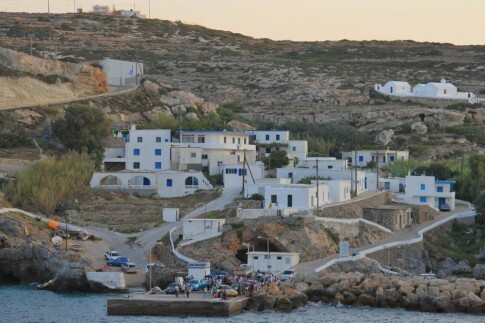 The majority of travellers to these islands take the shorter ferry from Neapolis, over 4 hours driving to the south west of Athens, and in late 2013 government tried to withdraw the subsidy which would have seen the Piraeus link cease. An outcry followed and eventually agreement was reached which would see the Vitsentzos Kornaros continue (her scheduled retirement and replacement as outlined in the earlier 2009 contract between Lane and the government appears to have been brushed under the carpet). 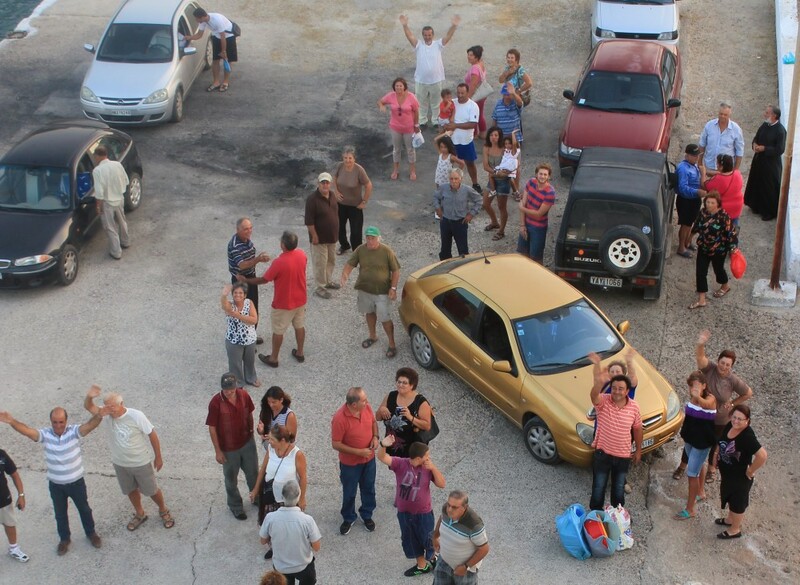 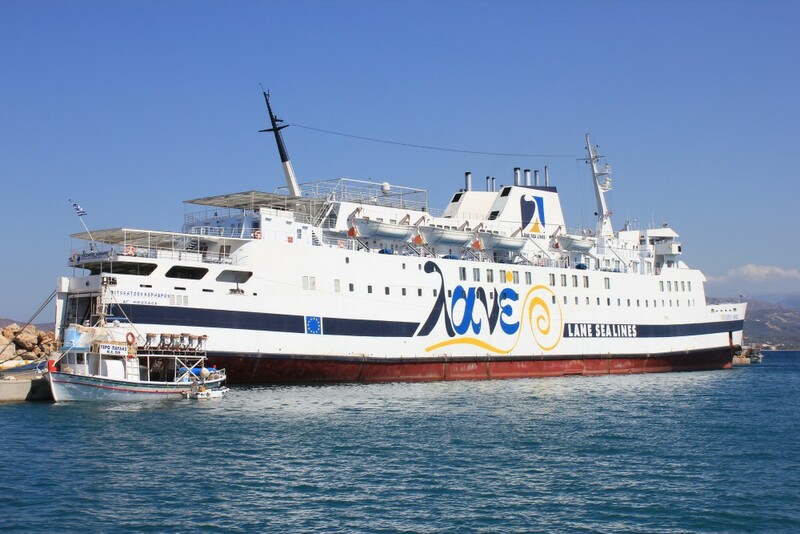 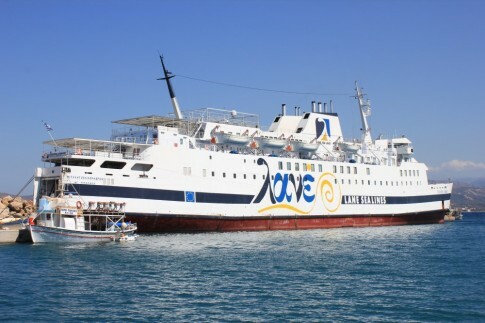 It is not really expected that many passengers will sail direct from Kissamos to Piraeus (direct sailings from Chania, 30 minutes away from Kissamos, leave much later and tend to arrive earlier) so most are heading to or from Kythira and Anthikythera. 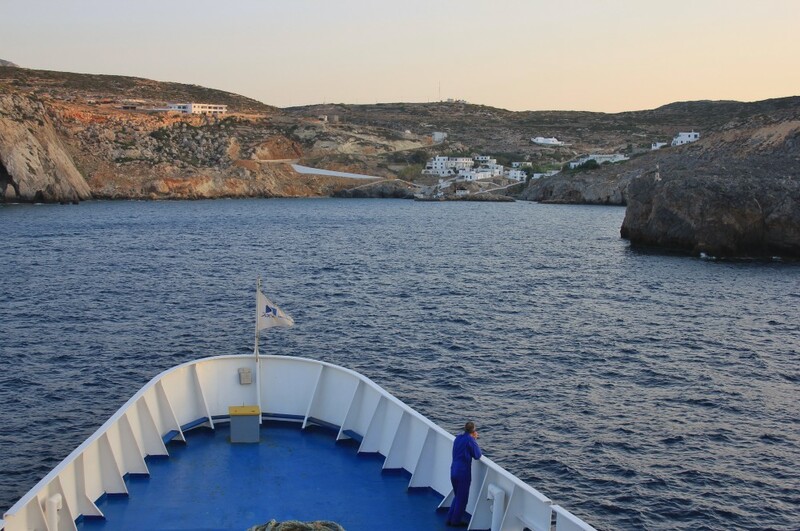 But the salvation of the route was fortunate not just for islanders but also for travellers seeking a sail on a vintage ferry operating one of the most fascinating routes anywhere in Europe. 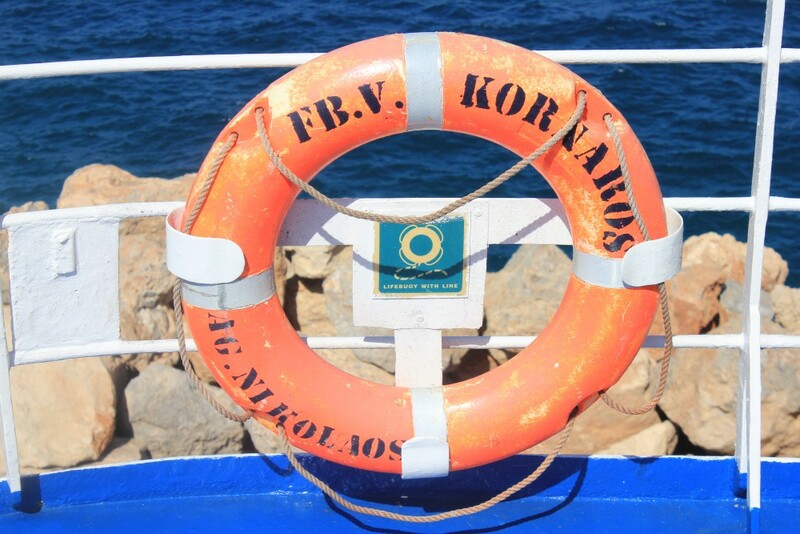 The Vitsentzos Kornaros at Kissamos. 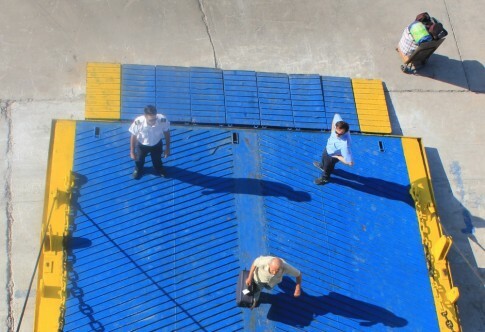 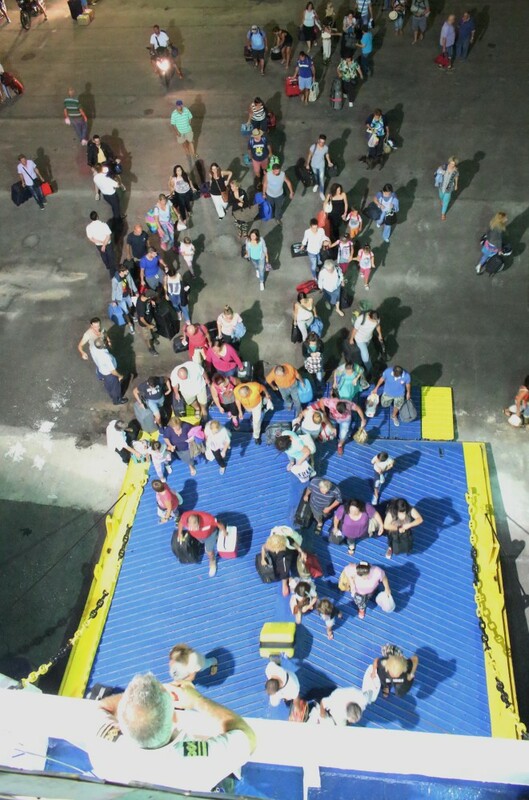 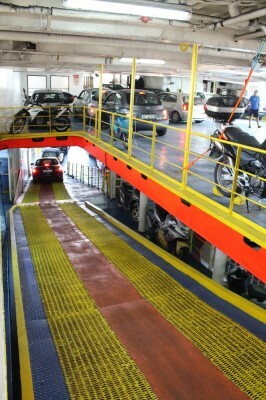 Boarding over the vehicle deck. As built the ship had retractable mezzanine decks covering the whole width of the this space but at some stage the sections between the engine casings have been removed. 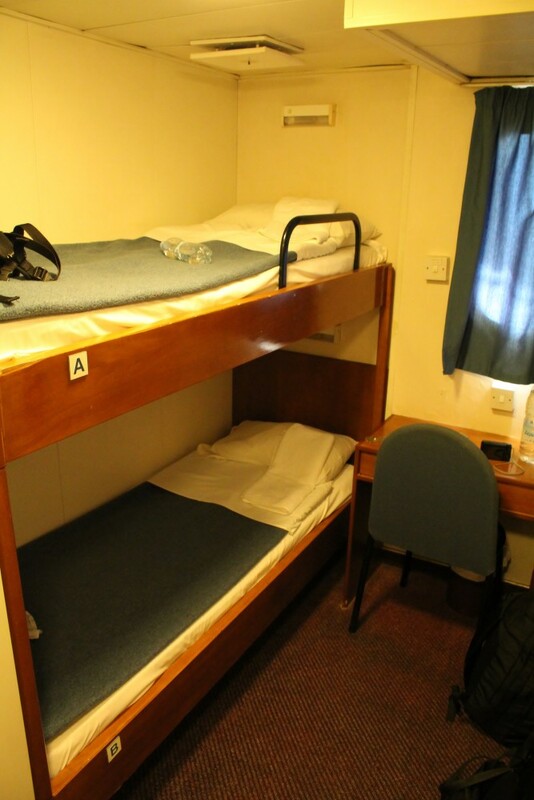 Two berth cabin on present-day Deck 7 (originally B Deck). 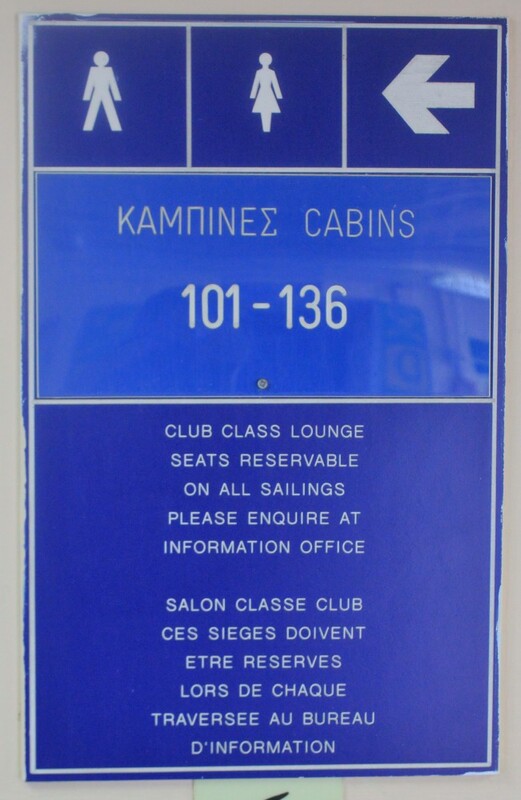 Although looking appropriately vintage this room was installed by Lane when the ship came to Greece having latterly been part of the Club Class lounge with P&O. 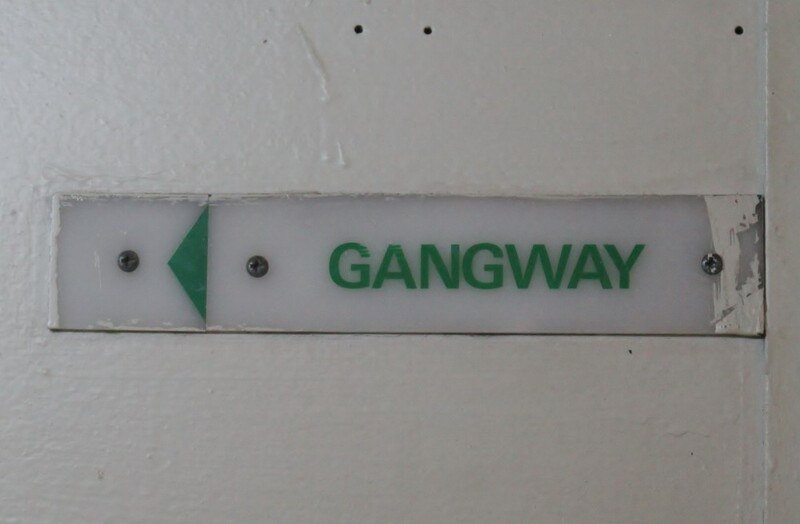 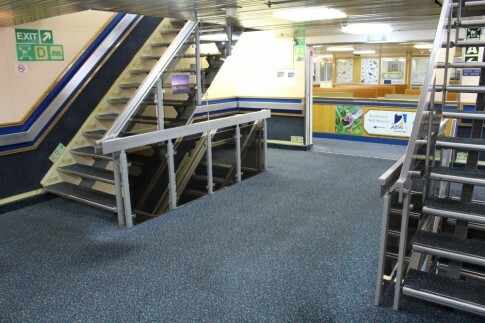 The amidships stairway on Deck 6, looking aft to the self-service. 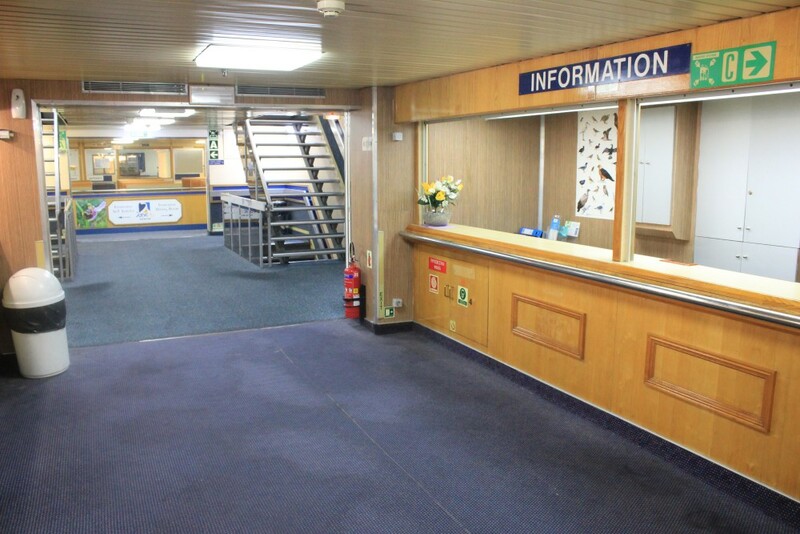 Just forward, the main reception desk is still retains its P&O-era light wood look. 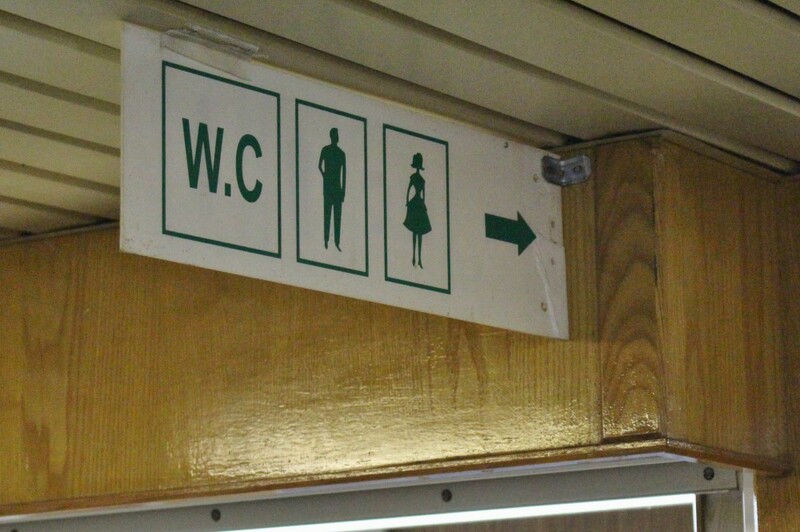 Little bits of original TT green signage have survived. 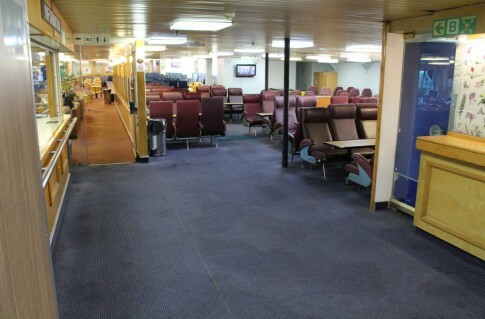 Lounge area right forward, overlooking the bow. 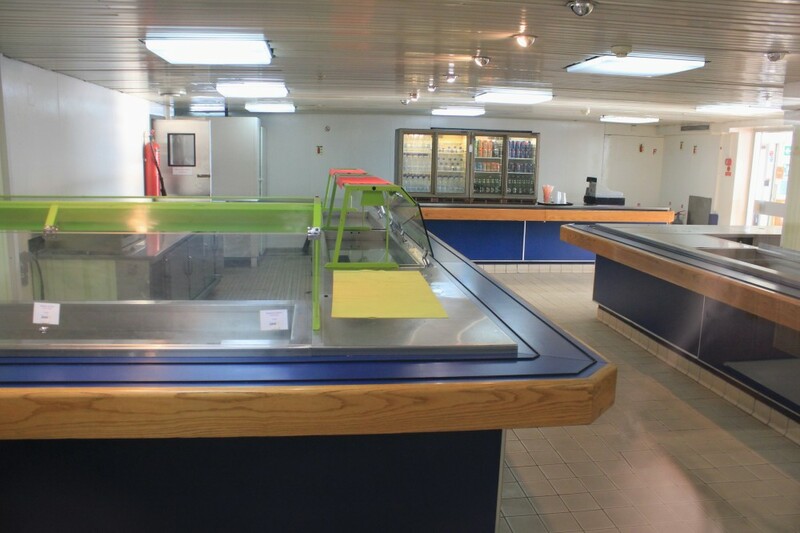 Heading aft, the self service still bears more than a passing resemblance to its original 'Food Fayre' setup. 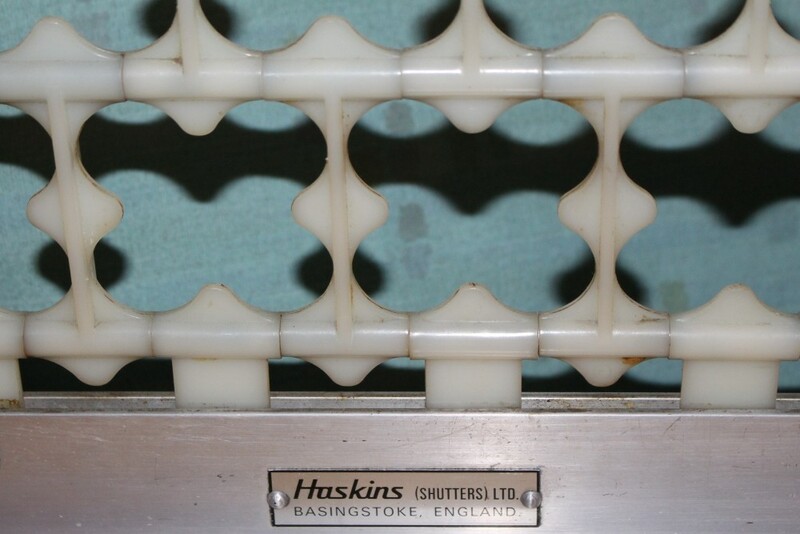 The forward bulkheads in this area retained their large prints showing scenes of Winchester cathedral by the Sussex artist Judy Strafford until around 2010 but these have now been removed. 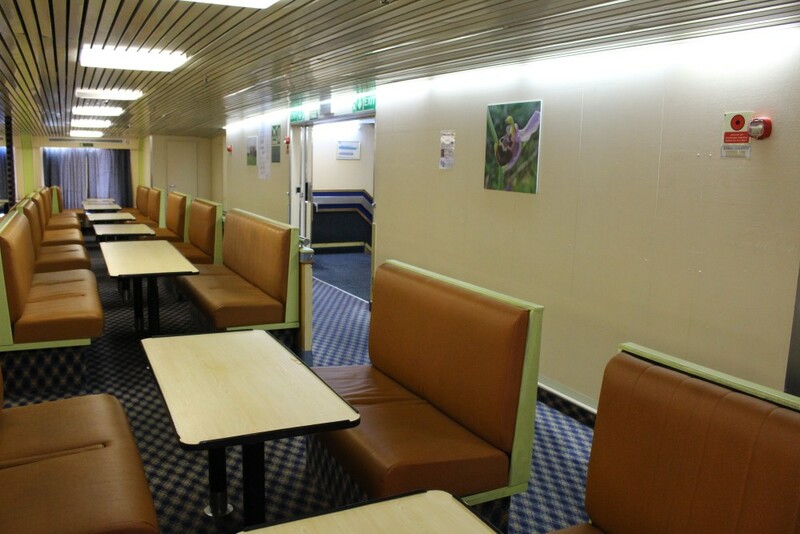 The servery area remains very P&O. On the port side of the self service, looking forward. 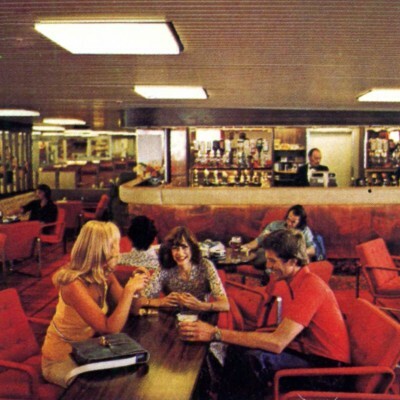 At the stern is the former restaurant with the pictured section originally a cocktail bar. 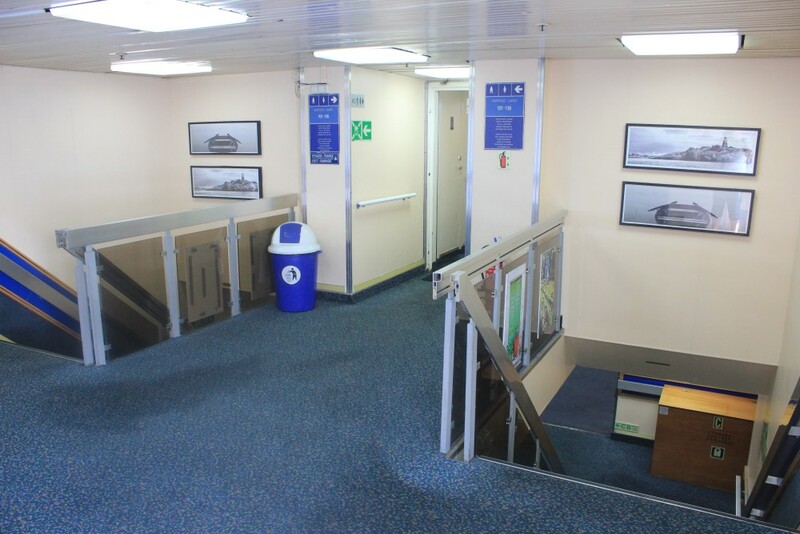 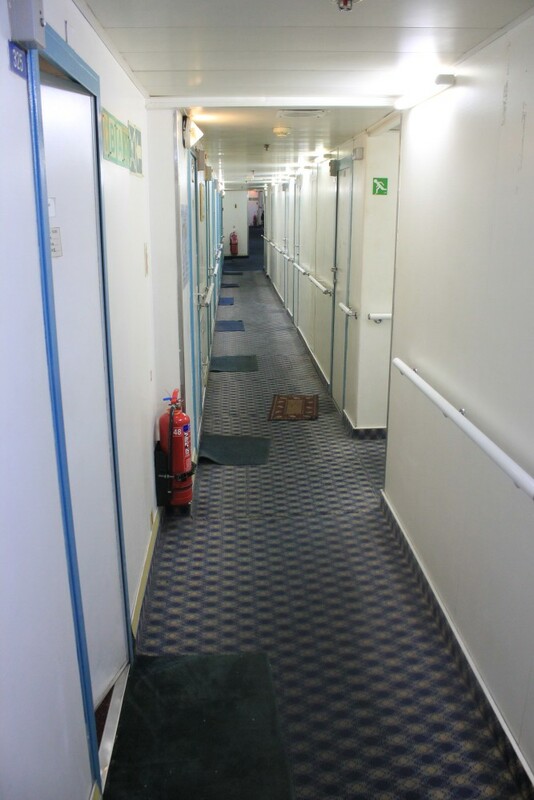 Heading back upstairs, this is the midships lobby on Deck 7; Club Class was just forward of this but has now been reconverted into an area of cabins. 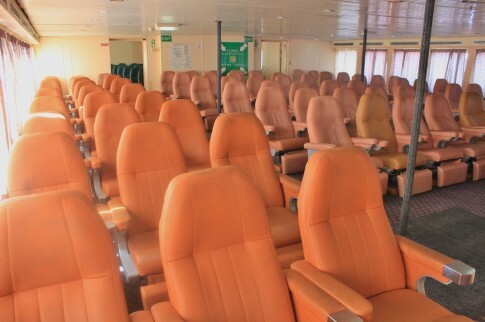 Up another level are a pair of reclining seat lounges of which this is the forward one. 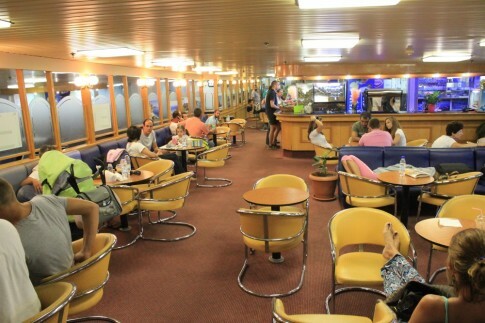 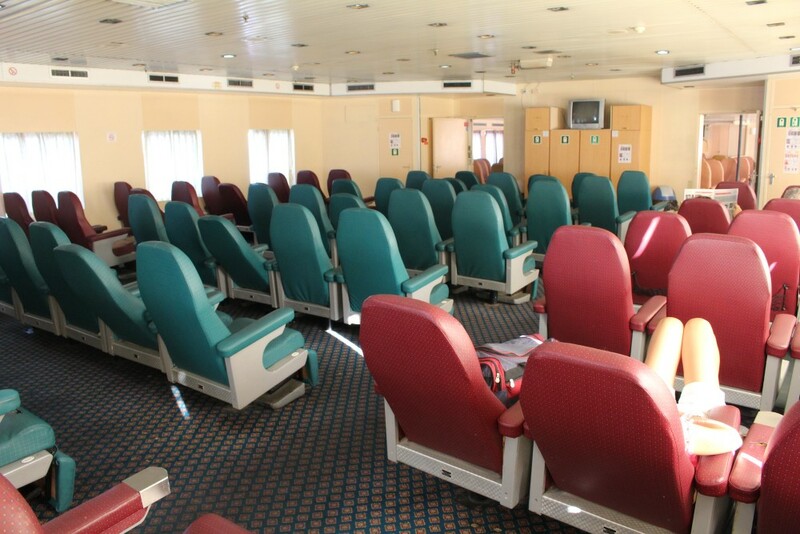 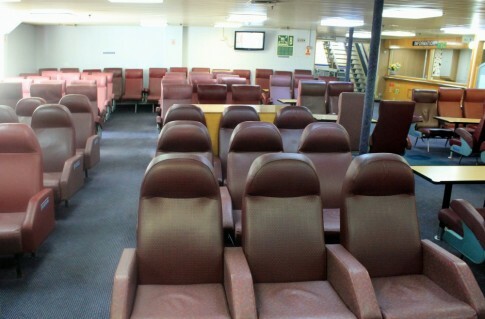 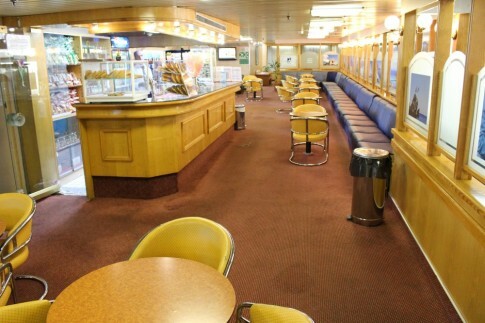 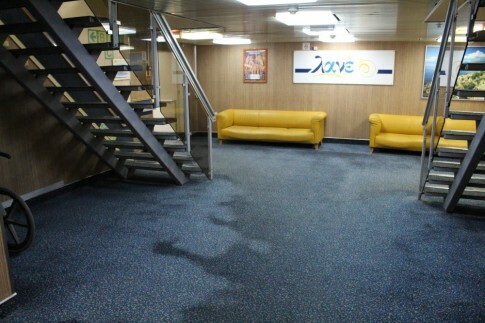 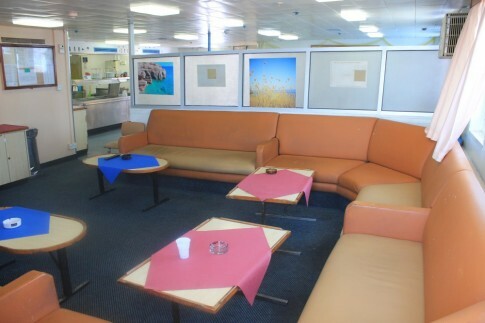 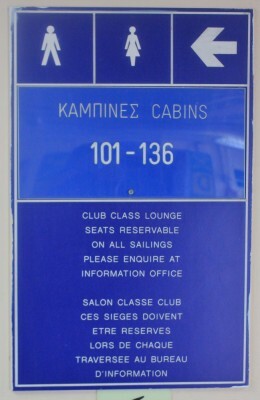 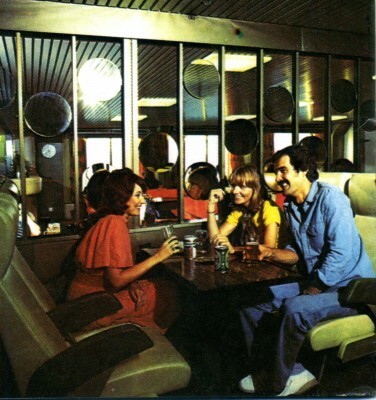 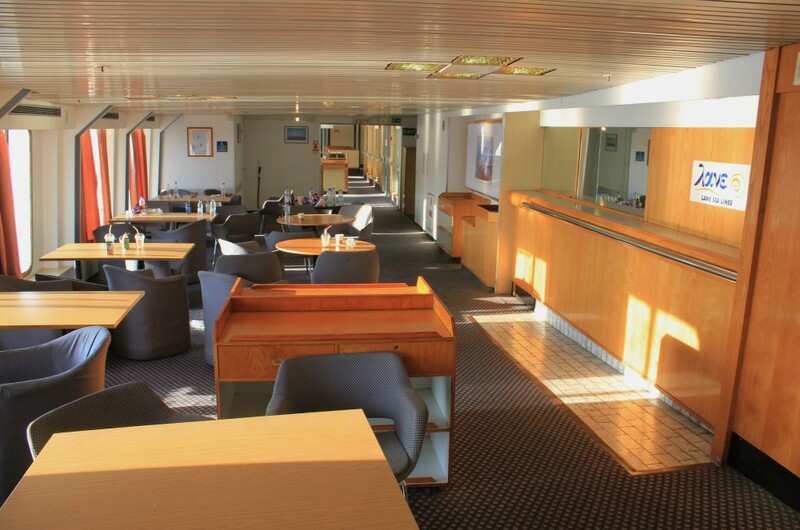 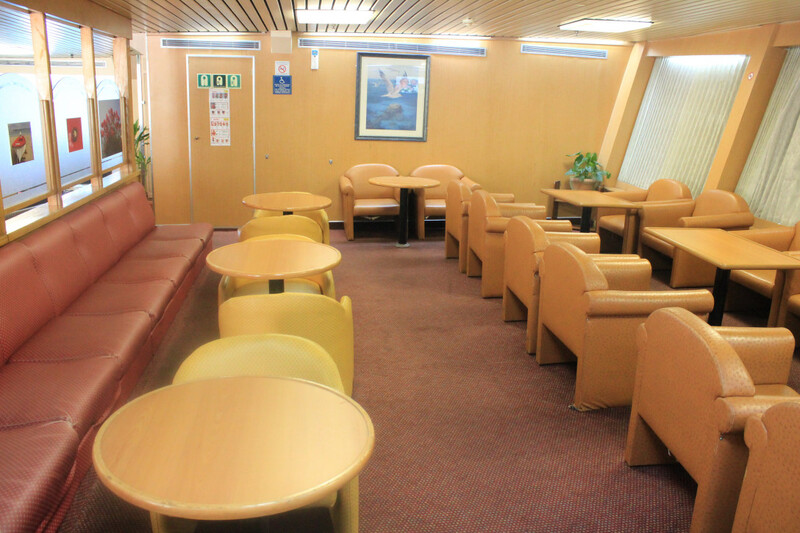 The aft lounge is the former cinema and was not an original feature of the design, being added to all four ships very early in their careers. 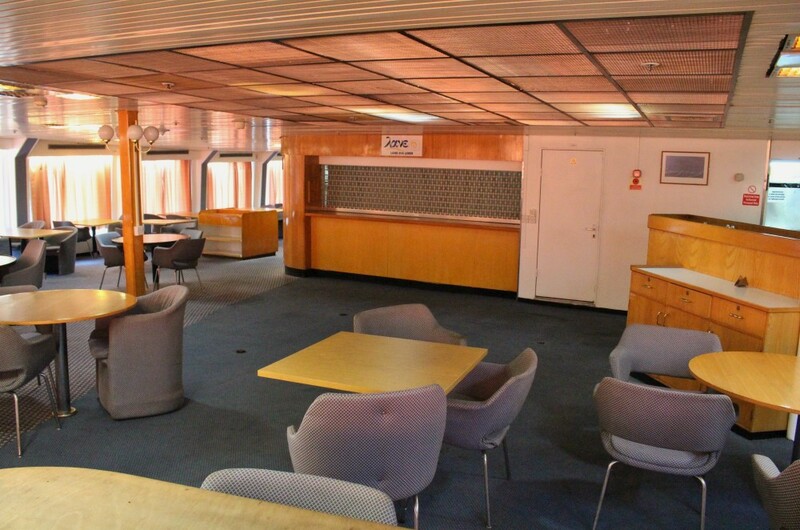 Down to Deck 5, this is the midships lobby. 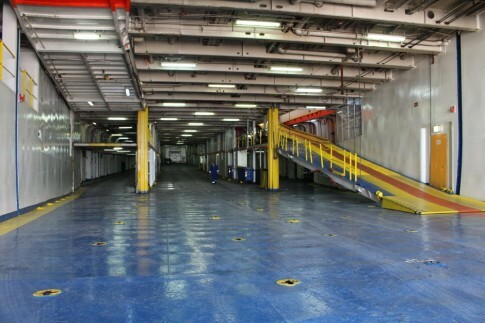 This deck housed the bulk of the passenger cabins as built (with the upper garage aft). 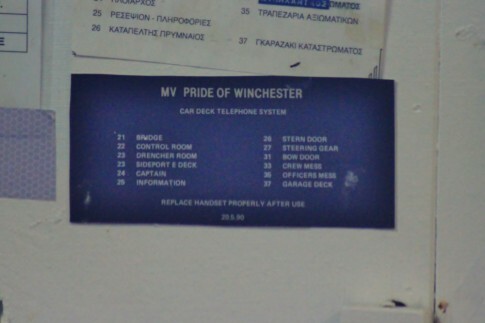 These are all now given over to crew. Back on deck to watch departure. 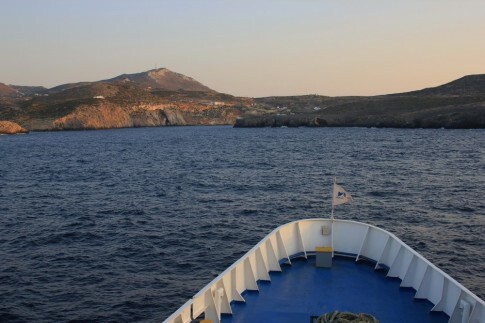 A few hours later, we approach Antikythera, which has a year-round population of less than 50 people (rather more stay there during the summer). 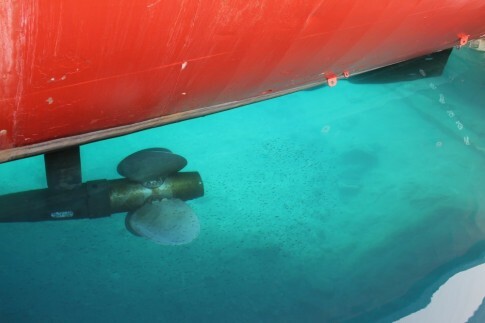 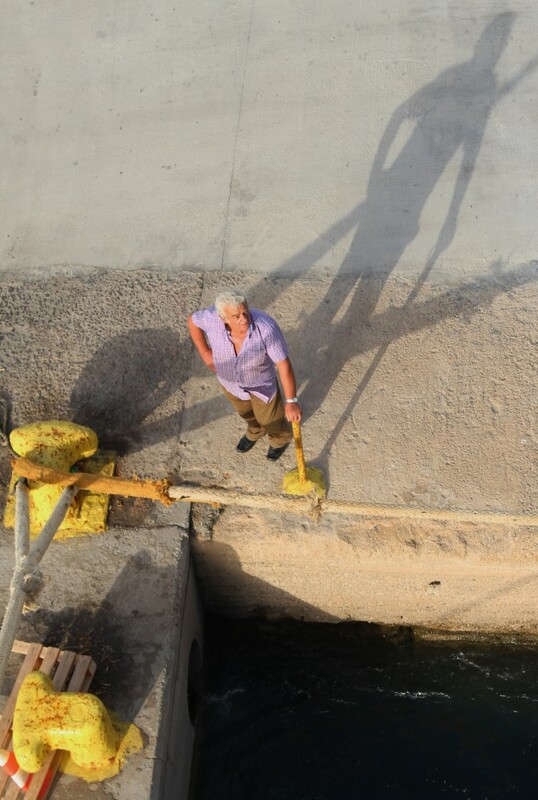 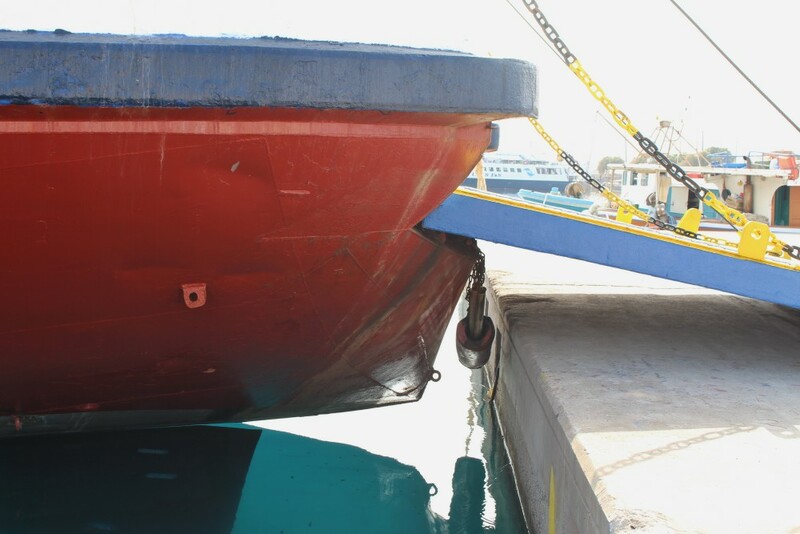 The ship has to execute a tight 180 degree turn in the tiny bay to present her stern ramp to the quayside. 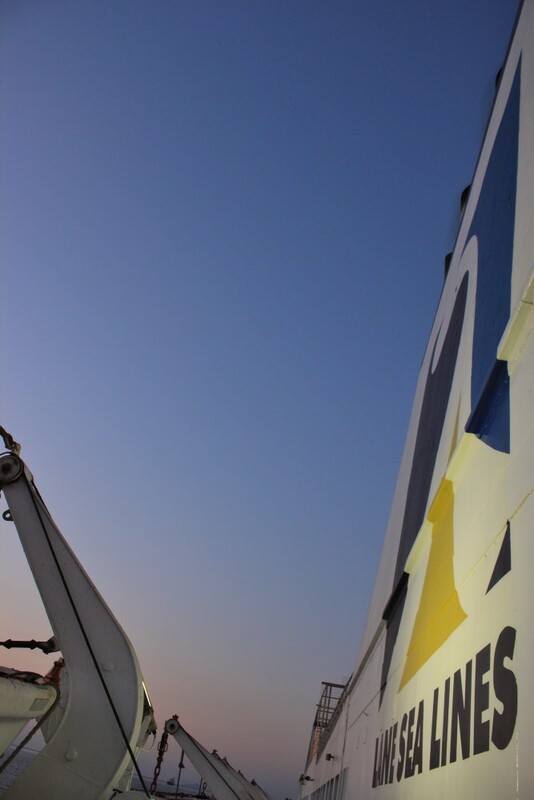 After a call of no more than 10 minutes we are away again. 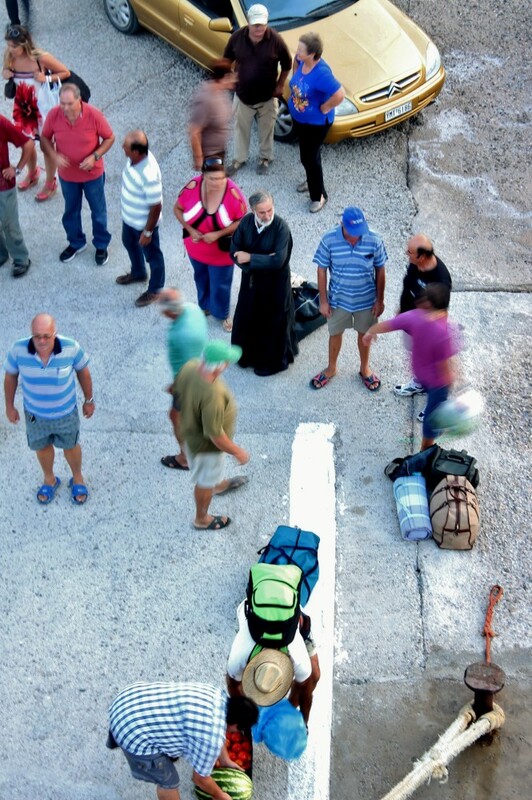 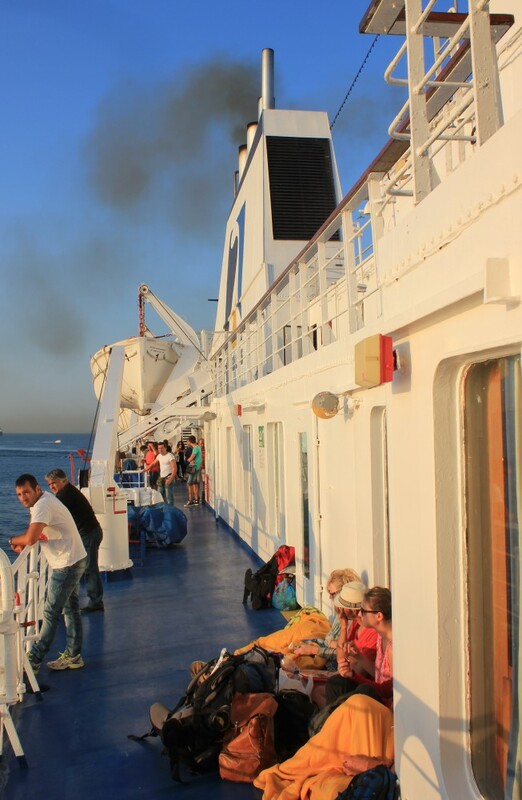 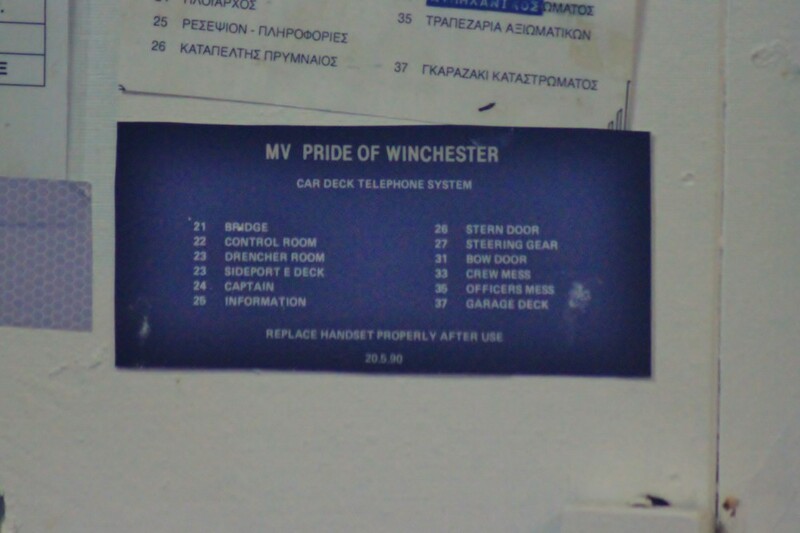 Things are a lot busier downstairs after the first port of call, but the majority of the ship's passengers have still to board at the next island call, Kythira. 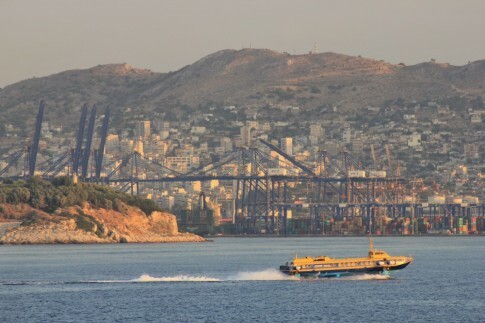 An early start the following morning finds us slowly approaching Piraeus - we are running late so must wait off port as the morning departures make their exit. 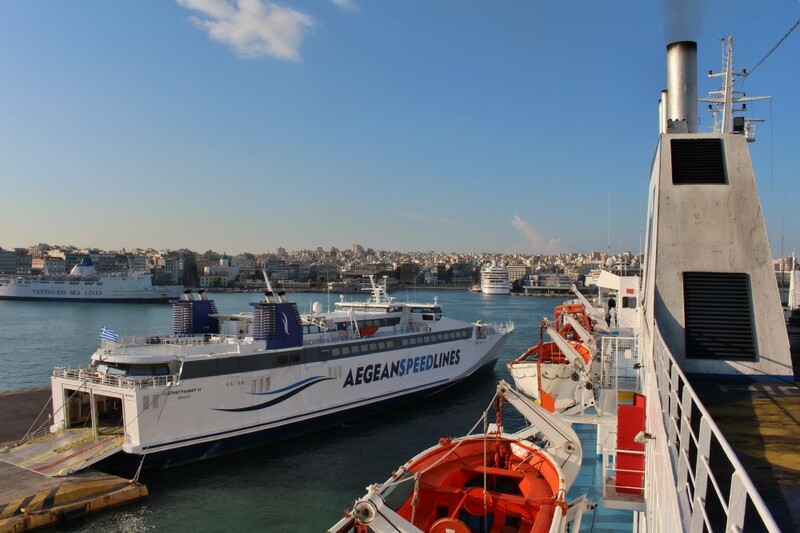 The Pelagitis sweeps past en-route to the ro-ro terminal. Spongebob Squarepants (left), Agios Georgios (background) and Flying Dolphin Athina. 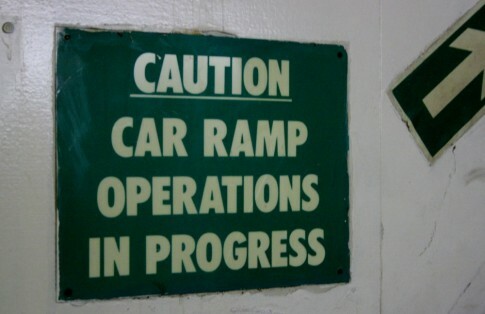 Disembarking via the upper garage ramp. 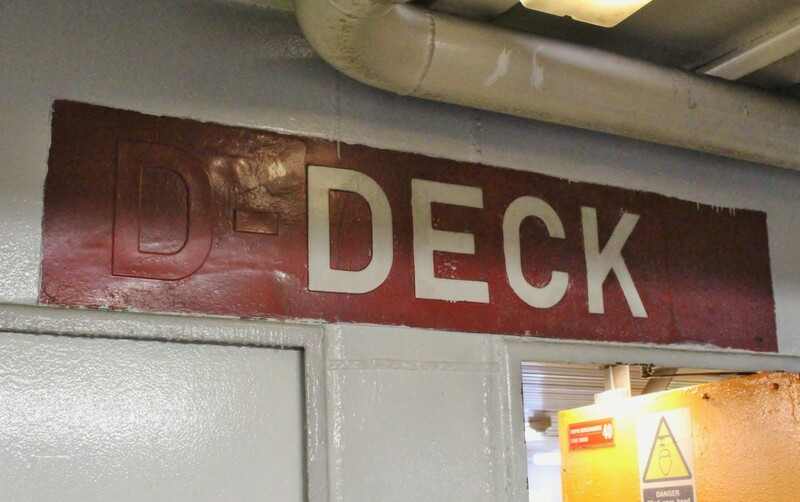 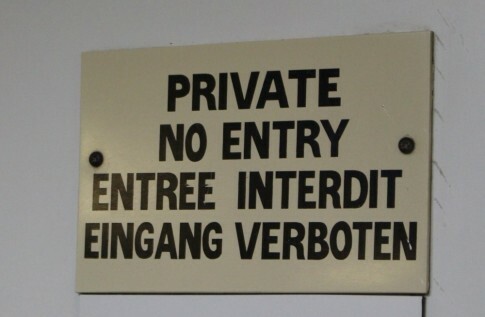 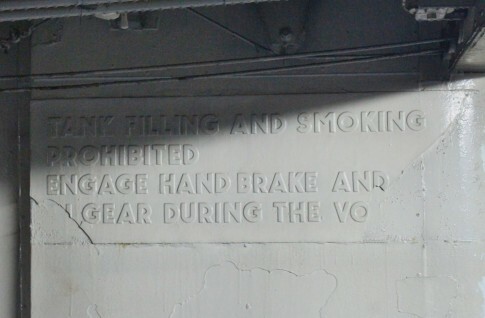 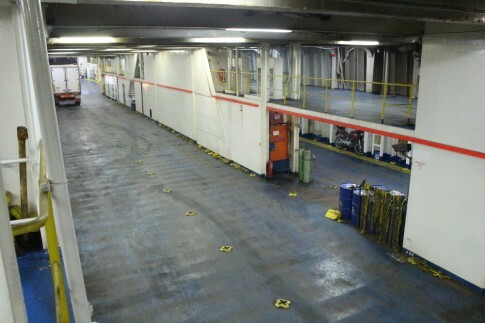 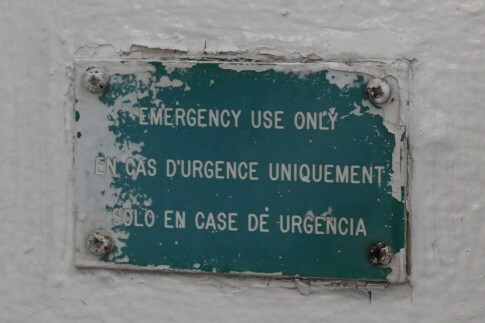 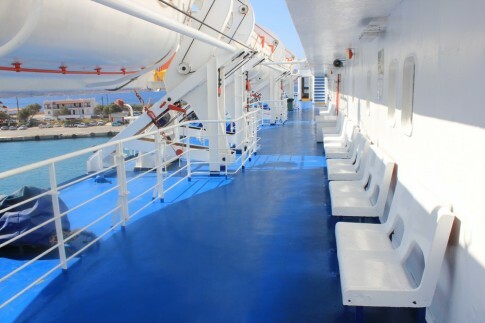 The present day Deck 5 was originally D Deck before the mandatory renumbering of decks on passenger ships was enforced.